First rule of rock and roll: Make sure the music knows how much you love it. So, since the beginning, rockers have praised, named, and given thanks to rock and roll in song. Chuck Berry did it. So did Lou Reed and Joan Jett and Led Zeppelin and David Bowie. Laying his claim, Jesse Wells does it too, in one of the fuzz-fed brush fires he and his band – simply called Welles – light on this debut album. 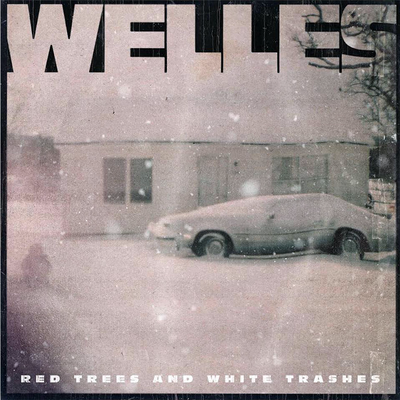 The sound of Red Trees and White Trashes is confrontational and fun, marked by psychedelia and grunge (in 2015, Wells released a cover of Nirvana’s “Heart Shaped Box”) but with a little bit of Southern pastoralism in the mix. Wells grew up in Arkansas and, until recently, lived in an art commune in the gorgeous mountain lands around Fayetteville. In his gently drifting power ballad “Seventeen” which may be a bit of a tribute to Big Star’s great song about the same kind of angst, “Thirteen” – Wells tells his messed-up love he’d like to bring them to “Ar-Kansas, where there’s beer and molasses” and a certain immunity to time and those titular “red trees and white trashes” dot the psychedelic landscape. The feel of this album recalls other 21st-century Southern rock survivalists like Cage the Elephant and All Them Witches – artists who’ve found inspiration in the region’s woodsy cover and nighttime heat, and are keeping feedback-fed rock alive by not worrying about anybody else’s idea of what’s cool. At only 23, Wells is already writing hooks that any of his heroes would envy. In Nashville he’s found bandmates who can take his vision past what he could do in Fayetteville’s coffee houses and backyards. The sound on this album is huge, putting Welles in the same league as the smart bands reviving rock’s mainstream right now, like Royal Blood and Greta Van Fleet. Produced by Beau Boggs (who’s known for his work with Nashville mavericks from Jamey Johnson to Natalie Prass) and Bobby Emmett, with three tracks helmed by Dave Cobb (reminding the world here that he started his ascent as a producer in a rock band of his own), Red Trees and White Trashes has the heft and complexity to likely earn a few Grammy nominations; but it’s also obvious that Wells will always be comfortable in some dirty rock and roll kitchen where, as he says in one song, “everyone’s kinda ugly in that way that looks pretty,” girls in blue bobs are smoking something illegal, and somebody’s turned the amp up to 10 on the other side of the screen door. “It’s just summer again,” Wells cries as the bass line creeps like a snake in the grass. “Giving it away to the night life trend all again.” Giving it away to the thing that gives it all to you: rock and roll. So, basically, you just copied and pasted NPR’s coverage of Welles’ album and posted it here…as your own? Got it.